Chennai, India In what is believed to be his tenth incarnation, Lord Vishnu “the Preserver” appeared to 87 year old Sag Aloo, a fisherman from the state of Tamil Nadu in India, as a 0.73 kg (1.6 pound) red snapper. When his call ended, Sag turned back to find that Lord Vishnu, who had been making an “annoying throat clearing noise” just a few moments before, was dead. Sag was despondent – and then a miracle happened. 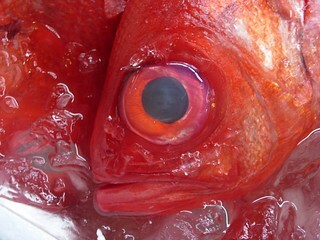 The image of Buddha appeared in the dead fish’s eye.